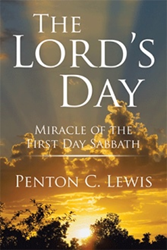 With over 30 years’ experience of studying and teaching the truth of God's word, Penton C. Lewis felt a strong desire to share the significance involving Jesus Christ’s atoning work, and the blessings he provided and found in the “First Day Sabbath.” With this, he penned The Lord’s Day: Miracle of the First Day Sabbath (published by Xlibris), a book containing biblical facts involving the changing of the Christian's day of worshiping from the seventh day to the first day. “The Lord’s Day: Miracle of the First Day Sabbath” is a comprehensive study containing detailed biblical evidence supporting the New Testament’s account regarding the changing of the seventh day Sabbath to the first day of the week. The book is easy to read and filled with hundreds of Biblical passages that are written out for the reader’s convenience. The book is designed to assist any that are confused or misguided, and it will also provide insight to those that are observing the first day Sabbath but are unaware of the Biblical facts involved. The book also contains an additional study of the Holy Trinity.